Here it comes, my first video DIY, an iPhone Dolly. Ok, we are in the third millennia so no chauvinist dolly jokes. A dolly is a piece of video shooting gear which is used to create smooth horizontal movement. The kind you often see in action sequenced when a train is wracked or when you go over a row of soldiers in a line up. 2 small pieces of lumber. About 20 cm X 2 cm X 4 cm. I just used small leftovers from building my fence. You’ll also need an old bitten up skateboard (if you were here in the 80’s you probably have one in the attic. And of course an iPhone. Actually, this will work with any video camera. But using an iPhone gets an extra cool factor. 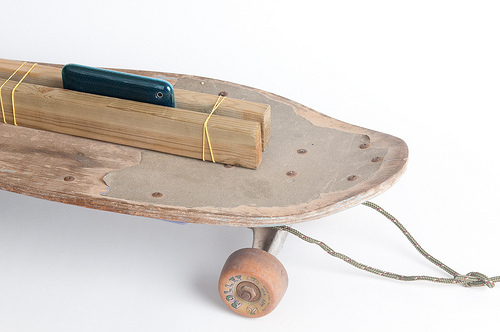 Optionally, you’ll wanna use a long piece of string to tether your skateboard. 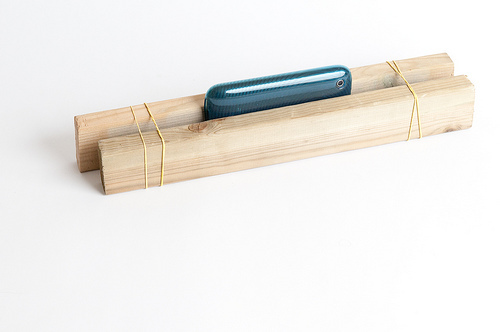 Use the two rubber bands to put the two pieces of wood together. Place the bands at the ends of the wood. Then simply sandwich the iPhone between the two pieces of wood like so. Make sure you have the camera peeping from the top. This step has two flavors. If you only want to make a short movement, all you need to do is to put the mount+iPhone on the skateboard. When you get to the location simply push the board away. If you need a longer distance, you may want to tie a rope or a string to the front of the board so you can pull it over longer distances. Start the iPhone (or other camera) before you start rolling. Then place it in the mount. You’ll need a smooth surface for this to work, wooden floor works great. Some smoothed out cement will work too. (Check the Chase Jarvis link at the beginning of the post. It will definitely work in a skateboarding arena). The start and end of the roll will be at slightly different speeds from the middle of the shot. Start before the actual start and end after the actual end. Did you make one? Shot some videos? Share it on the Flickr pool.